The Oceanic ProPlus X is a console style dive computer. It is a full-featured scuba computer that pretty much has any possible feature a diver with any experience level could ask for. The screen is simply brilliant and navigation is easy with four buttons. The large display is very clean and shows all important information without confusing you. The display is one of the largest you can get on any scuba diving computer to date. Air integration is through the high pressure hose. The Oceanic Pro Plus X can deal with up to 4 air and Nitrox mixes leaving no desires unfulfilled for an experienced diver. Designed for intermediate and experienced divers. However, beginners should have no problems with it. Gauge style scuba computer with quick disconnect from hose. Four button design making it easy to use. No touchscreen. Pretty high in price. Offers all features needed for most divers and as such not overpriced! The Oceanic ProPlus X pretty much has everything you want and need. From a clear and colorful display to 4 gas mixes to automatic altitude adjustments and built-in compass. You get it all. On top of that you also get Oceanic’s dual algorithm. The battery is rechargeable and as such it’s pretty easy to make sure you always have enough battery. The memory on board is enough for 99 dives. Last but not least, the connectivity to your computer, tablet or phone is through Bluetooth allowing you to download dive data even while you’re still on the boat going back to shore. There’s really not much you wouldn’t like. The only improvement we would wish for is to have a touchscreen display. That would propel the ease of use to the next level. Having said that, the four button navigation is simple enough yet you will need to get used to the use of the buttons and pressing them short or long for different features! The highlight of the Oceanic ProPlus X is clearly the display. It’s clear and shows all information with crisp fonts and graphics. It’s also a plus to have a rechargeable battery so you won’t depend on having batteries available when you are on a dive boat and realize that your battery gets low. Being a console device it wouldn’t make any sense to have or to expect a freediving mode. The Oceanic ProPlus X offers nearly any feature you could ever want. 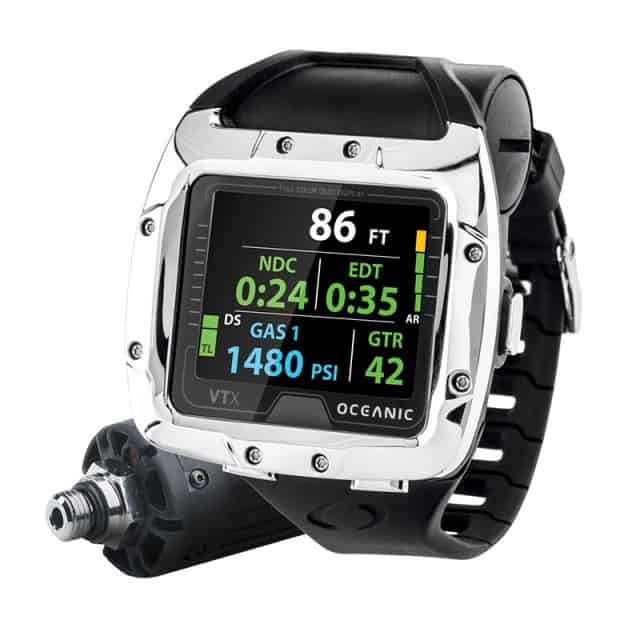 The price reflects that but is overall reasonable considering that you get everything in one single device and won’t have to buy a cheaper scuba computer together with a pressure gauge and compass. The Pro Plus X combines all that into one device and in the end might even end up saving you money! The display is nothing short of brilliant. While the VTX is using an OLED display, the ProPlus X uses the TFT technology. This reduces glare and makes it overall easier to read. The colors and contrast are a little lower but it’s in no way noticeable. The diving computer supports up to 4 gas mixes. These can range from 21% to 100% O2. Gas switching can be performed under water during a dive. 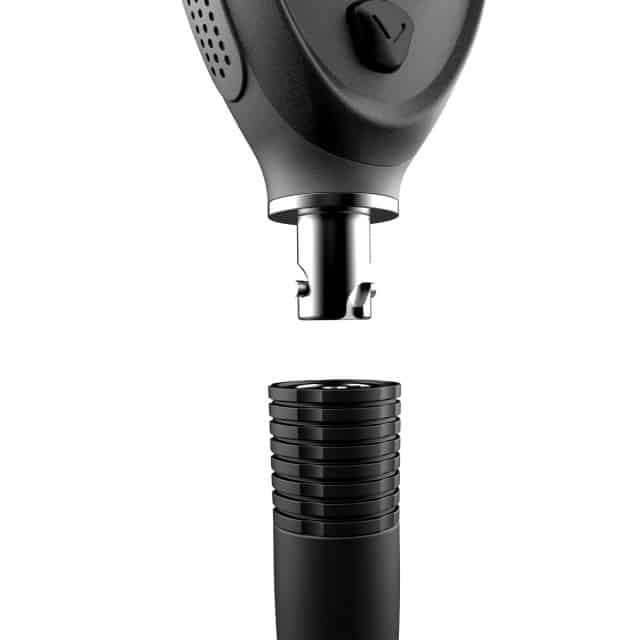 Air integration on the Oceanic ProPlus X is handled through a high-pressure hose that connects to your regulator. While you do end up having a hose that can get in the way, there's no need for additional equipment like a pressure gauge. With wireless air integration a sensor can easily fail or run out of battery which is not a concern to have when you get the tank pressure through a hose. The device features a compass that is easy to use. It also measures the temperature and shows it on the screen. Other displayed information shows the remaining tank pressure and air time remaining, dive time remaining as well as elapsed dive time, depth, battery level and no decompression time remaining. Bar graphs represent the nitrogen tissue loading, air time remaining, oxygen loading and ascent rate. The temperature is displayed on the screen and constantly updated. The display comes with a solid backlight. It is using the OceanicGlo technology that is activated through a button as well as the SmartGlo backlight which is sensor activated. This helps to produce a consistent intensity depending on your surroundings. You can adjust the time that the backlight is on to increase battery life. All data can be viewed in imperial or metric units. You can easily switch between those through the settings. The time can also either be displayed in 12 or 24 hour format. Additionally, you have a built-in calendar and a 12/24 hour time to fly countdown. You also get a calculated desaturation countdown timer. The ProPlus X uses a rechargeable battery. The air integration is handled through a high-pressure hose and as such doesn’t need a battery to measure the pressure in the tank. Battery life on the device is between 35 and 60 hours depending on the use and features used. For example using the backlight a lot will reduce battery life significantly. Alarms and warning are clearly displayed on the screen. They are also available in audible form and you have to acknowledge them through pressing a button. 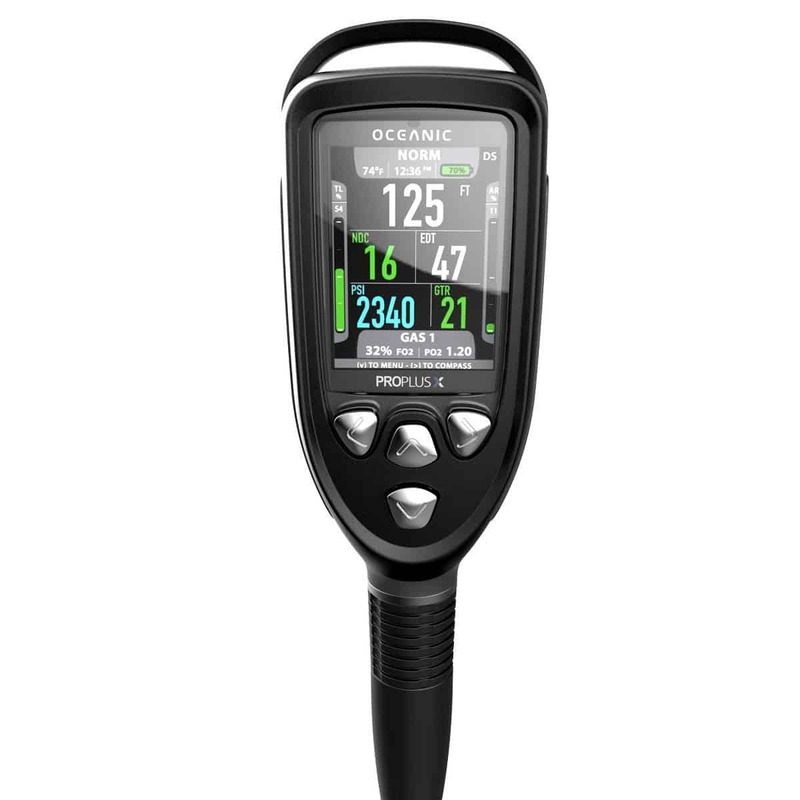 Similar to all other Oceanic dive computers, the ProPlus X also features the dual algorithm technology. This allows you to switch between a Pelagic Z+ (Buhlmann ZHL-16C basis) or the Pelagic DSAT (Spencer/Powell model). You can also add a conservatism factor to each of the algorithms. The ProPlus X can handle up to four different gas mixes. Each mix can be set to have O2 levels between 21 and 100 percent. You can manually switch between the gas mixes through a menu selection. The O2 levels can be preset on land. Another handy feature is that the Pro plus X automatically adjusts the altitude settings. The algorithm is based on NOAA. The altitude is automatically adjusted between 2,000 and 14,000 ft (610 to 4,200 m). The on-board dive log has a capacity to hold data for up to 99 dives. You can then connect through Bluetooth with your computer, tablet or even phone to offload the data. You won’t need any more cables to connect which in the end will save you money as you usually have to pay for the optional connectivity cabling. There are really no main features and functions that are missing. For technical diving it would be great to have a Trimix capability but for 95% or more of the divers this is not needed anyway. There’s seriously not much you wouldn’t like about this dive computer. It feels like splitting hair trying to find negatives about it. The pros clearly outweigh the negatives in this case. Using four buttons for navigation instead of a touchscreen is somewhat personal preference and after going through the manual once and playing with the Pro Plus X for a little while you will not feel like you’re missing anything compared to other devices. As with most gear you will typically find the best selection and lowest prices on Amazon. Check the current pricing by clicking on the button below! This device has been introduced not too long ago. There’s not much customer feedback available but the feedback that can be found it overwhelmingly positive! Please check out the following comparison table where we show key features and differences between this scuba computer, the Suunto EON Steel and the Oceanic VTX. 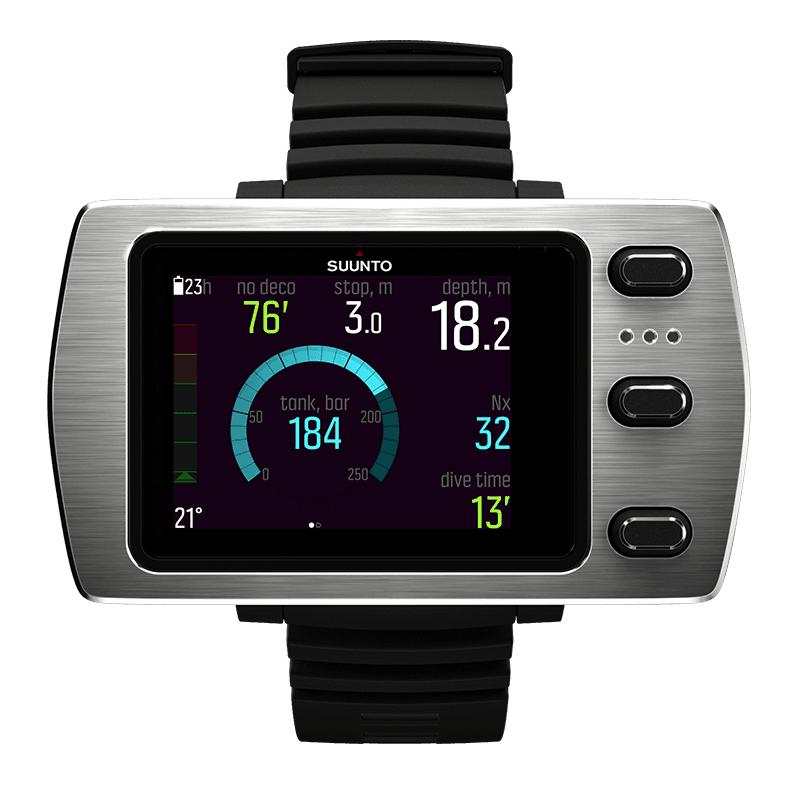 You can also check out our in-depth review of the Suunto EON Steel for further information on this great scuba diving computer! 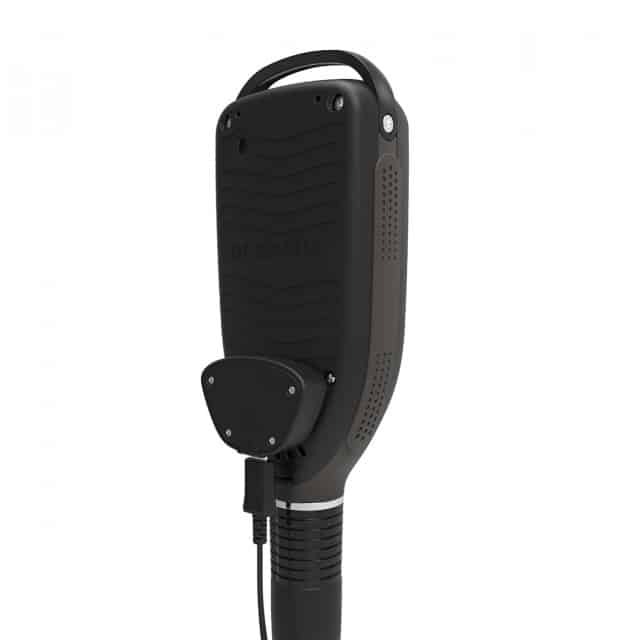 The Oceanic ProPlus X is a full-featured dive computer that will satisfy the needs of nearly ever diver. Nearly any feature you can imagine is available with the exception of dealing with Trimix. Pricing is on the higher side. However, you save a bunch of cash by not having to purchase additional wireless air transmitters or optional connectivity kits and cables. You also won’t need an additional pressure gauge and compass as it’s all built-in. The Pro Plus X is easy to use and as such even beginners won’t have problems using it. Overall, it’s designed for intermediate to experienced divers that love to dig through the data and display all pertinent information on the screen. The screen is large and allows to display a lot of data. It even features a number of bar graphs that are easy to read. If you prefer to have a wrist dive computer and not a console mounted device then this is clearly not the right gadget for you. Also, if you insist on having a touchscreen display then this will not be the right scuba computer for you. Navigation is performed through four buttons and is easily mastered. Data oriented divers will be happy with the Pro Plus X. It offers a large number of data points and you have a strong dive planning capability. The on-board log is large and allows to store and review the last 99 dives. Overall, this is one of the most capable scuba diving computer you can get. It’s pricy but the features justify the price. The display is simply gorgeous and easy to read. The navigation is easy enough to even allow beginner divers not to be overwhelmed!